I’m really happy to hear that another premium tea brand has made its way to this small, caffeinated island. 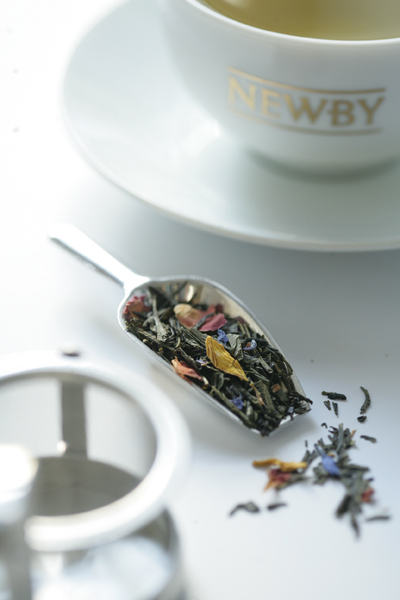 We could always do with more good tea – and Newby of London has the track record of serving up many delightful cuppas. It was established in 2000 and has loyal customers that include the three Royal Castles in Stockholm, 7-star Burj Al Arab in Dubai and the offices for the President and Prime Minister in Poland. It has also won around 85 awards from the North America Tea Championship and the British Great Taste Awards. The new Singapore team from Newby of London kindly sent over some samples for me to try. I tried their Hunan Green Tea and the Kan-Junga Tea with the ladies from Pekoe & Imp, so there’s a bit of input from them as well (including ripping the pyramid bags to drink the tea loose leaf heh). 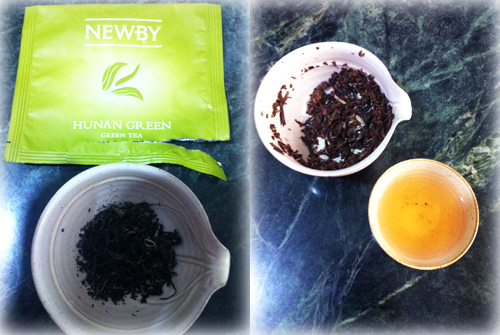 Hunan Green Tea (Ling Luo Chun): According to Jacq, this type of tea is all the rage in London now. We all agreed that this was a decent Chinese green tea with strong grassy notes. However, the amount was on the scarce side (to brew it Chinese tea ceremony style at least) so we only got a few sips of it between the three of us. 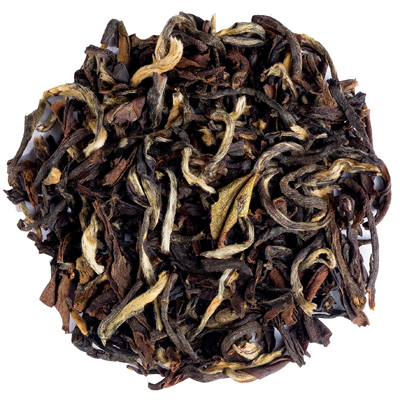 Kan-Junga: A sweet, muscatel black tea from Himalaya that we unanimously took a strong liking to. In fact, HY loved it so much she ordered Jacq to brew her a huge mug of it after the tasting. Jacq said it was “comparable to a Margaret’s Hope 2nd Flush Darjeeling” (I think that’s a good thing). I dig it too so I’m including a close-up shot of it here – please try it someday! Darjeeling: I also really liked this! It had the typical muscatel notes, but also had this subtle woodiness that gave it a bit of a kick. There was this faint clove-like fragrance emanating from the steeped leaves which I found fascinating. Jasmine Blossom: I think I’ve kind of “gotten over” Jasmine teas in general, so for me, I felt I would rather want to taste the actual tea as opposed to the strong floral aftertaste. However, for Jasmine tea fans, this would really make a lovely brew (it had these beautiful whole white Jasmine blossoms sprinkled in it too, so very pretty). Peppermint: I’ve tried a lot of peppermint teas, and this has become one of my favourites. I’m seeing how I can arrange to buy a large supply of this! There was this natural sweetness to it, and had a stronger minty aroma compared to other mint teas I’ve tried, which absolutely goes down in my books! Rooibos Tiramisu: Yep, I think I’m definitely off flavoured blends (and also am not a Tiramisu person). Generally, I prefer rooibos just with good ol’ honey and a squeeze of lemon. But I appreciate the creativity of this blend with bits of barley malt, cocoa beans, roasted chicory root and white chocolate – the Tiramisu flavour was nailed down perfectly and also had all these textured bits to make it a fun drink. I’d say this would go really well with Christmas pudding or fruitcake. 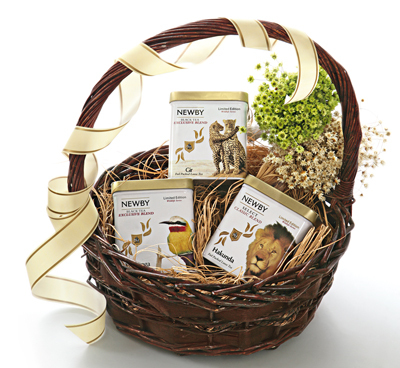 Contact marketing@newbyteas.sg if you would like more information.